Commonly referred to as “Mr. Chicago” by his friends, Ed Paschke is one of the Windy City’s most celebrated artists. Born and raised in Chicago, Paschke earned his BFA from the School of the Art Institute of Chicago in 1961, and after traveling to Mexico, Europe, and New York, returned to SAIC for his MFA in 1970. Some of Paschke’s earliest artistic influences were the animations of Walt Disney, as well as the colorful caricatures the artist’s father drew on the letters he sent home from Europe during WWII. During his time at SAIC, Paschke began displaying work with a group of young artists that would eventually become known as the Chicago Imagists. Though he frequently participated in exhibitions with other members throughout the 1970s, he considered himself to be on the periphery of the Imagists group, and supplemented his involvement with them by exhibiting regular solo shows in both Chicago and New York up through the mid-1990s. Like the other Chicago Imagists, Paschke’s work was influenced by popular culture and Surrealism; however, the artist often combined the group’s overly bright, neon colors with photographs from newspapers or magazines to create a more ominous version of Pop Art. Recently, one of Paschke’s brightly-colored pieces came to us in need of care. The work was housed in its original frame, and our conservators noted several inscriptions on the verso of the piece that detailed exhibitions in Paris, Dallas, and at the Art Institute of Chicago. In addition to these inscriptions, the painting also exhibited a signature that read “E. Paschke ’86”, placing the work squarely in the middle of the artist’s career, a few years before one of his greatest milestones: a traveling career retrospective exhibited by the Art Institute of Chicago in 1989. Upon further examination, our conservators noted the painting appeared to be executed on a linen canvas with selvage edges running down both vertical sides (a selvage edge is the tightly-woven edge of a canvas that prevents the fabric from unraveling as the canvas is woven). The canvas exhibited numerous deformations scattered throughout the painting, primarily on the left half of the piece. There were varying degrees of deformations, dents, and areas of embossed paint throughout the entire piece. The canvas was very slack on its support, and exhibited a complex L-shaped tear in the bottom right quadrant of the painting. 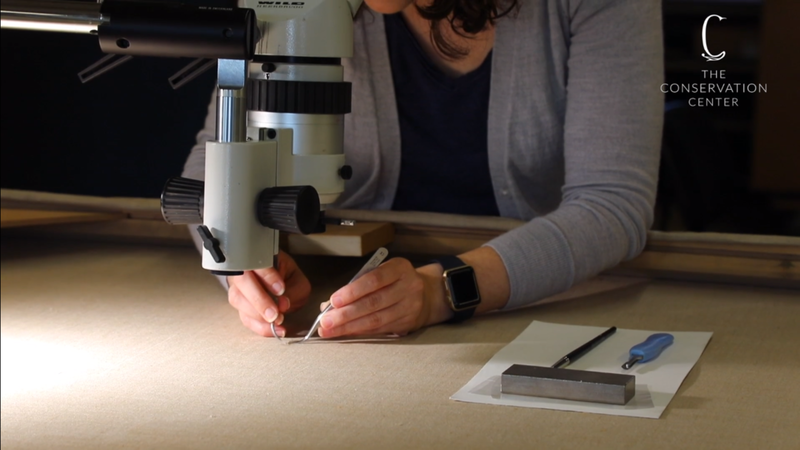 The canvas exhibited additional holes along the edge of the canvas - our conservators determined these were possibly part of the artist's working method. The ground layer appeared to be primed white, and the paint layer was characteristic of thinly applied oil. The paint layer exhibited a fine network of drying cracks, mainly in the dark red colors of the piece. The cracks appeared to be secure, and our conservators determined that they were not extremely visually disturbing. The paint layer exhibited losses around the L-shaped tear, as well as an abrasion in the lower left corner along the bottom edge of the piece. The painting appeared to be unvarnished, and had minor scattered accretions throughout. The painting also exhibited a light layer of surface grime. Our Painting Department began their treatment by consolidating the flaking paint locally around the tear using conservation adhesives. Next, the painting was surface cleaned to remove grime, and the painting reverse was cleaned using a soft brush and light suction into a HEPA vacuum. Accretions were reduced, and the canvas was carefully removed from the auxiliary support. Next, the canvas deformations were flattened as best as possible using a combination of heat, suction, humidity, and weight techniques. The tear was aligned and mended using conservation adhesive and bridging threads. Next, the strainer was replaced, and the labels and inscription on the original strainer were removed and retained with the painting. The canvas was then re-stretched onto a new stretcher. After the new stretcher was keyed-out to provide adequate tension for the canvas, losses were filled and textured using an appropriate conservation grade fill material. Next, inpainting was carried out in areas of loss and abrasion using reversible conservation paints. Once the painting was restretched and keyed out to provide adequate tension, its size increased slightly. In order to allow the piece to be reinserted into its original frame, our Framing Conservator extended the original frame to accommodate the increased painting size. The seams of the frame were hidden and the miters were finished and blended to match the surrounding area. The painting was then carefully reinstalled into its original frame to conservation standards. An acid free coroplast backing board was then attached to the reverse to provide additional protection, and new hanging hardware was added. Before returning the painting to its home, the client generously allowed us to exhibit the work at our educational EXPO booth, where art lovers can learn about the piece’s restoration process. Check out our time-lapse video of the crew assembling our EXPO Booth!